The head office of BIT-ON GmbH is located in Neu-Isenburg, about 5 km south of Frankfurt. The office is in the pedestrian area of central Bahnhofstraße, not far from the main link between Frankfurt and Darmstadt. The main highways A 3, A 5 and A 661 can be reached easily within a few minutes. Leave the highway A 5 at the interchange "Frankfurter Kreuz" and take the hightway A 3 in the direction Würzburg. Take exit 51/Frankfurt Süd und follow B 44 in the direction Groß-Gerau. Leave the road at the first exit to Neu-Isenburg and follow this street for approx. 5 km until you reach the Frankfurter Straße. Here, turn left. After 500 m turn left again into the Friedrichstraße and immeadiately right into the Adolf-Bauer-Straße. Right before the next left bend drive into the car park. You can reach the BIT-ON office through a passage which is connected to the Bahnhofstraße. Coming from Darmstadt leave the A 5 at the exit 23/Zeppelinheim and head for Dreieich. At the first traffic light turn left onto the B 44 in the direction Neu-Isenburg and take the first exit to Neu-Isenburg. Follow this street for approx. 5 km until you reach Frankfurter Straße. Here, turn left. After 500 m turn left again into the Friedrichstraße and immeadiately right into the Adolf-Bauer-Straße. Right before the next left bend drive into the car park. You can reach the BIT-ON office through a passage which is connected to the Bahnhofstraße. Coming from Würzburg on the highway A 3 Würzburg you come to the interchange “Offenbacher Kreuz“. Here take highway A 661 to Egelsbach and turn off at the exit 18/Neu-Isenburg. Turn left at the first traffic light and follow the street until you reach Frankfurter Straße. Here, turn right. After 500 m turn left into the Friedrichstraße and again right into the Adolf-Bauer-Straße. Right before the next left bend drive into the car park. You can reach the BIT-ON office through a passage which is connected to the Bahnhofstraße. Coming from the direction Cologne, leave the highway A 3 at exit 51/Frankfurt Süd and take the B 44 in the direction Groß-Gerau. 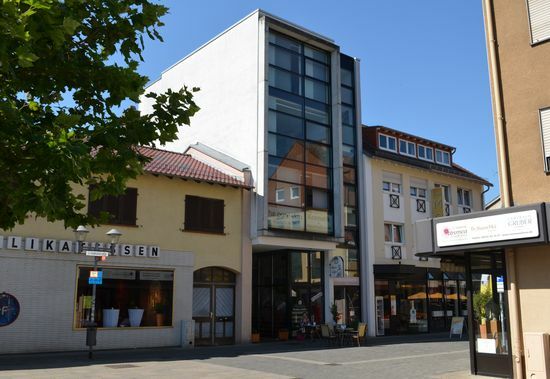 Take the first exit to Neu-Isenburg and follow the street for approx. 5 km until you reach Frankfurter Straße. Here, turn left. After 500 m turn left again into the Friedrichstraße and immeadiately right into the Adolf-Bauer-Straße. Right before the next left bend drive into the car park. 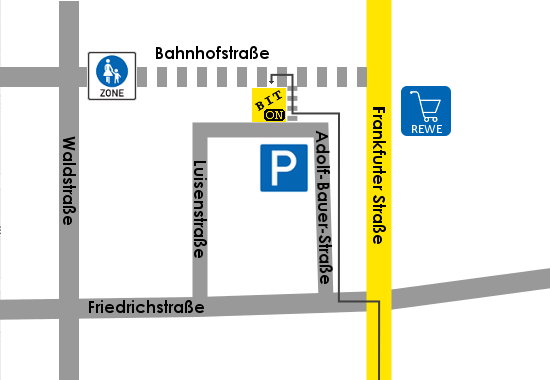 You can reach the BIT-ON office through a passage which is connected to the Bahnhofstraße.